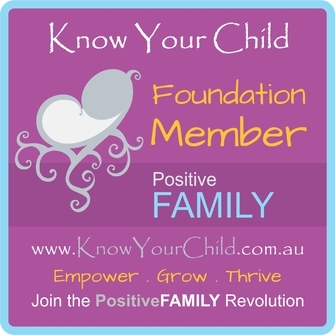 Provides a dedicated approach to your child's needs with the Know Your Child system. USE THE RIGHT TOOLS - Night training is different to day. You need to know the correct game plan to ensure you are helping, not hindering your child. 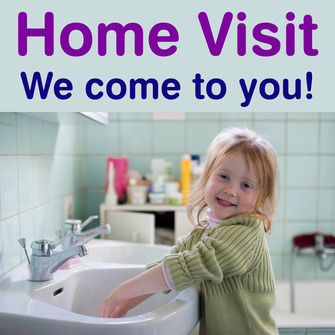 When you use the right tools you are giving you and your child the best chance for SUCCESS! The Dry Nights Pack has tools to cover - Correct Game Plan, Mangaging Wetness and Motivation to Go. FINISH DAY GO STRAIGHT ONTO NIGHT - Keep the momentum going. After day training, comes night training. Don't wait, keep the momentum going. The challenge with night training is there are uncontrollable factors that can effect your child's ability to stay dry. We can make it easier or harder for our child to win based on what we do. 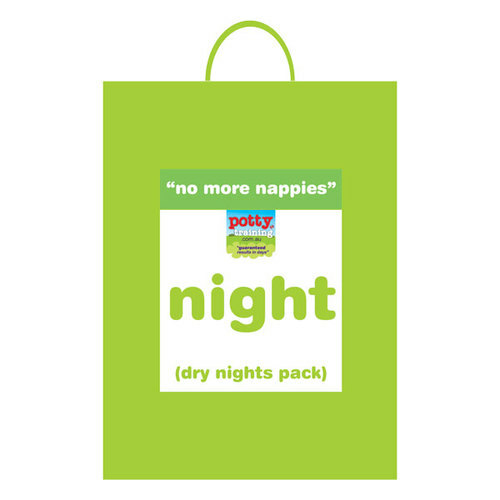 The "Dry Nights Pack" combines the three essential things you need to focus on in order to help your child to win. 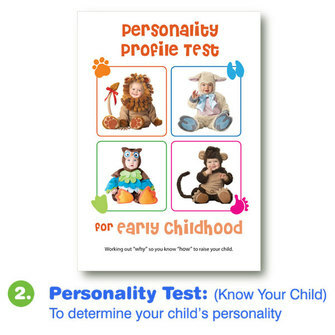 The first is knowing the correct game plan to help your child stay dry. For Night Training there are three things you need to look at to make it as easy as possible for your child to win. The Dry Nights Pack combines the best tools to help you and your child start the process of night training and stay sane. It is a teamwork thing, and can be tough on both parties involved. That is why it is so important to start with the end result in mind and apply techniques that will actually help, not hinder. Understanding that it is not your child's fault if they wet is integral to the process as our attitude makes a big difference to helping our child and ourselves manage night training to bring success. Understanding the ultimate goal of bladder/brain connection is the first start. 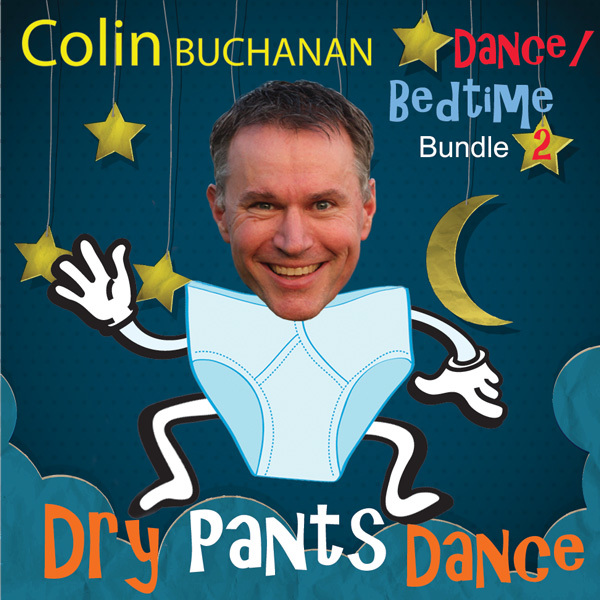 These 2 tools used together will give you the "correct" methods to help your child achieve night time dryness. Provides the practicalities required for night training. Simple details can make all the difference. It is important that you are prepared and following personalised strategies that will help, not hinder the process. 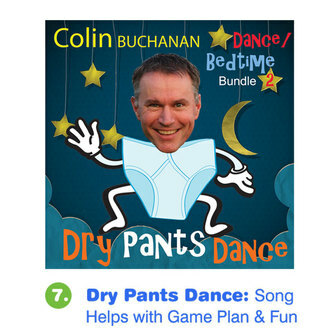 The amazing (and hilarious) Colin Buchanan helps children achieve dryness with the Dry Pants Dance. Aromatherapy, Colour Therapy & Play Therapy All in One! 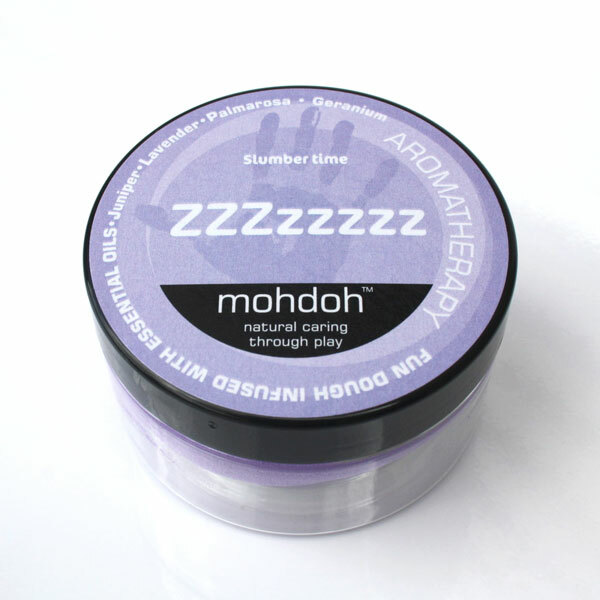 MOHDOH for Kidz is MOULDABLE AROMATHERAPY. 100% Natural. Packed with ESSENTIAL OILS. ZZZzzz properties can assist with NIGHT TRAINING and help your child get a good night's sleep. 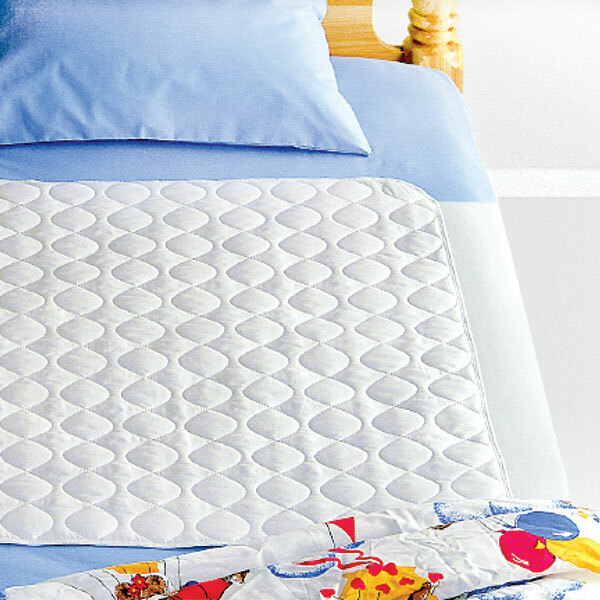 HOW CAN ZZZzzz HELP OVERCOME BEDWETTING? 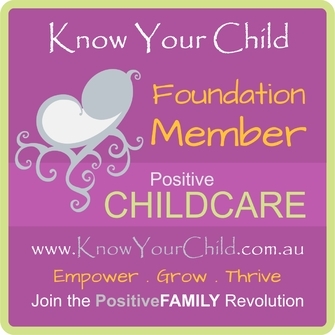 Providing a proactive routine for your child to follow rather than just "hoping they will grow out of it". Ensuring a good night's sleep by calming the mind and body and helping with respiration resulting in calmer relaxed breathing necessary to sleep well and help with prevention. Clarifying and refreshing the mind to help with the essential brain/bladder connection required to stay dry. Lose the Nappy is essential for success and a Pull-Up is just an overpriced nappy. To keep your sanity with this, you need a Waterproof Sheet Protector so that you don't have to strip the entire linen at 2am in the morning if we have an accident. I don't know how parents do it without this tool. 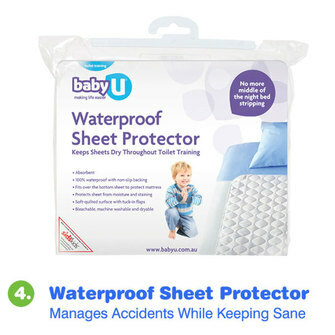 Most only have a Waterproof Mattress Protector which doesn't help with the actually training and sanity. There are two products in the Dry Nights Pack to help you with Managing Wetness with Night Training. Managing wetness is probably the toughest part for parents to keep going. Add in lack of sleep and loads of extra washing, if we aren't prepared in this area, it will be the key excuse to give up. The Waterproof Sheet Protector is then your sanity tool for night training. This is the physical aspect of how you cope with accidents at night. 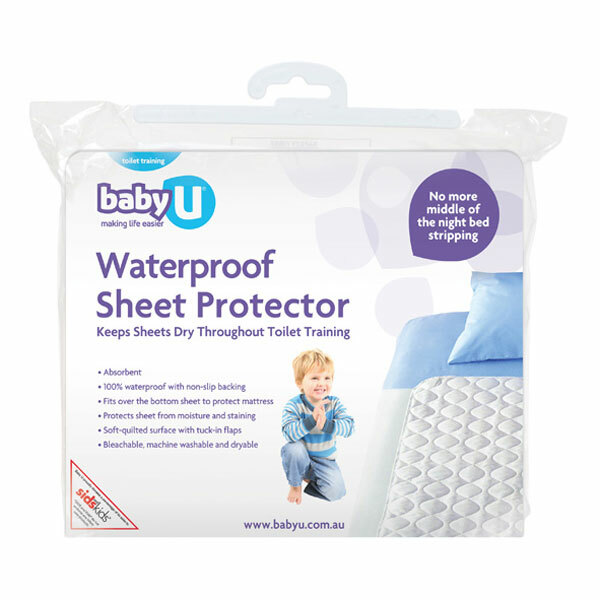 When you are ready to start night training you need to “lose the nappy” and use the waterproof sheet protector. It gets positioned on top of the sheets with wings that tuck into the mattress, so everything underneath stays completely dry. Machine washable and dryer safe, this is an economical solution to staying sane and helping your child feel wet while reducing your workload in the process. Absolute saving grace for staying sane with managing accidents. It fits a king single, single and cot mattress, and gets positioned in the "wet zone" to keep the linen dry. 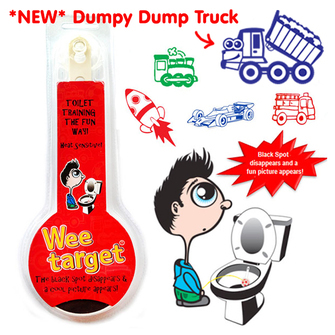 You need to lose the nappy for successful night training. 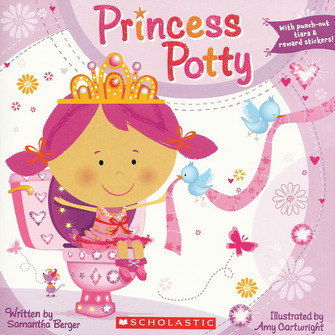 Your child needs to feel wet and uncomfortable to identify what their body is doing. 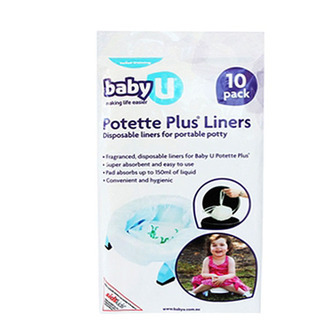 You absolutely cannot sucessfully toilet train with a pull-up disposable nappy pant. The Big Kid Pants are great for night training with their waterproof layer sewn into the wet zone. 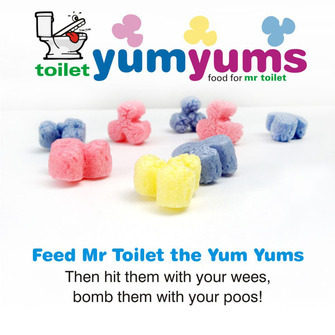 Please note, they are not a nappy and not completely waterproof. 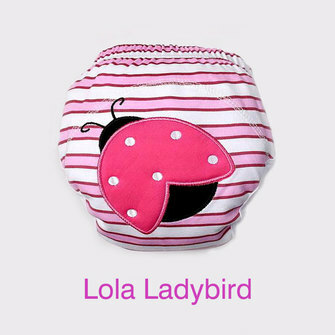 If your child does a large wee, which can happen with night training without the conscious effort to stop the wee while we are awake, a large wee can eventually leak out past the waterproof layer. This is why the Waterproof Sheet Protector is the best combination to use, in case a large wee occurs. 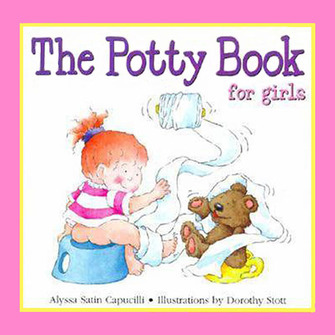 When combined with the correct game plan, to help with the bladder/brain connection, it can help your child stay dry or wake as soon as they initially wet. Subsequently, the Big Kid Pants help the top sheets stay dry when night training. 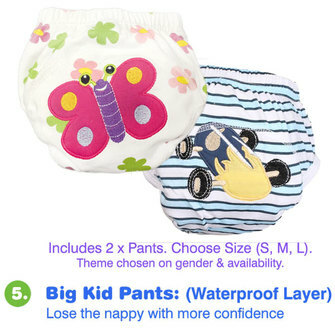 The pants are made from cotton and have a waterproof PUL (Polyurethane Laminate) sewn into the key wet zone. 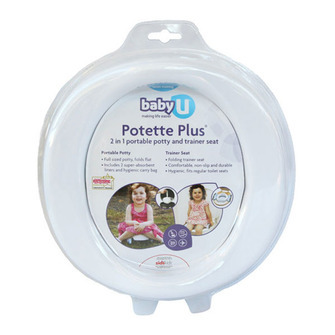 Use Natural Baby cleaning agents to extend the life of the pants. 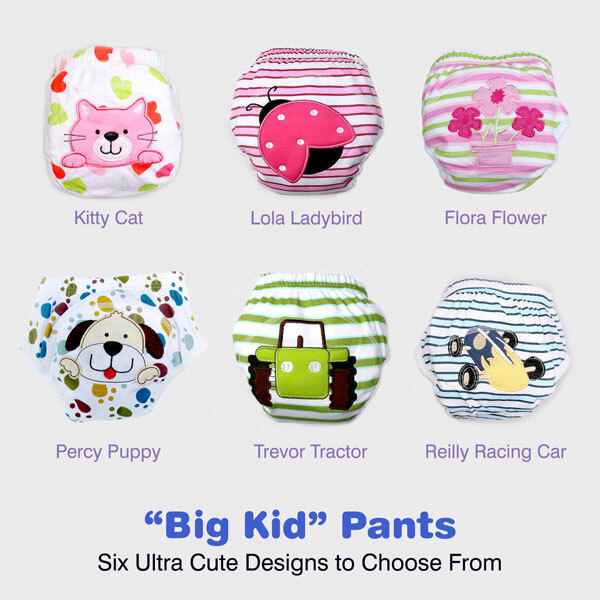 The Pants included are subject to availability, if you have a prefered theme please write in the comments when placing the order. 3. 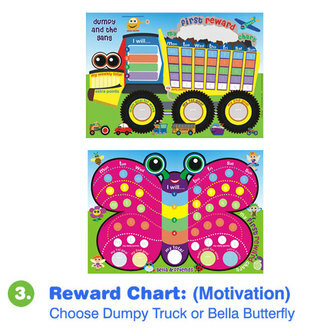 Motivation is to help your child “want” to stay dry and assist with triggering the bladder/brain connection. Motivation is important. You need to give your child a reason to get up and go. 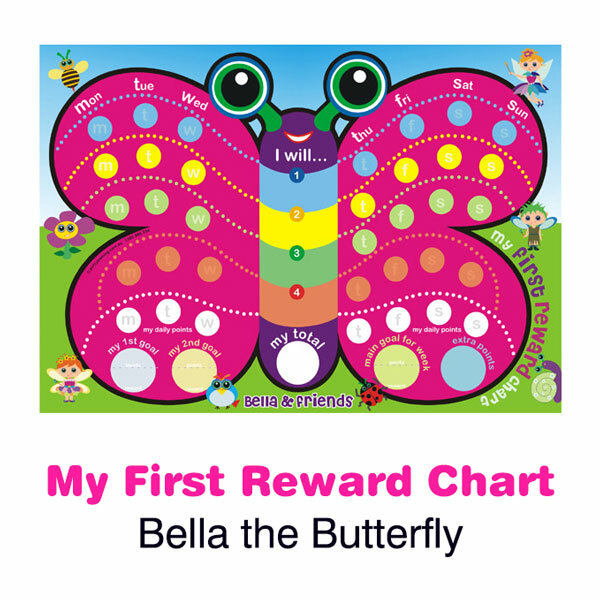 The My First Reward Charts are perfect for this and they are really good value as you can continue to use them after night training is finished for everything else - homework, manners, listening, that sort of thing. When used in conjunction with the Prize Box system your child will have a fun on their way to dryness. 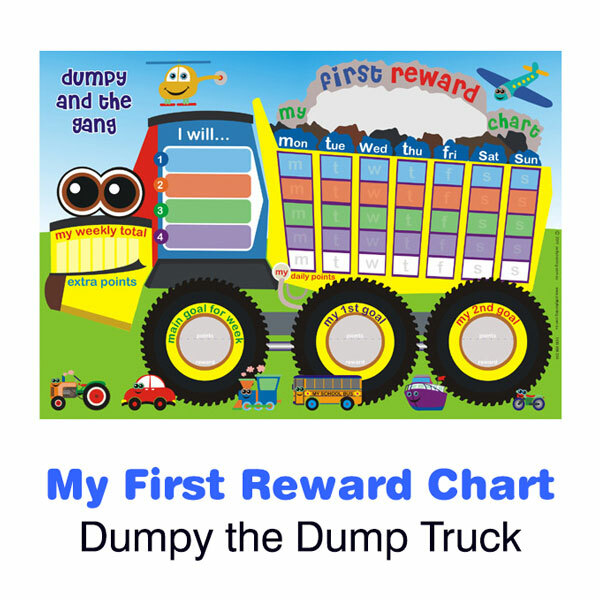 When you finish night training, this excellent tool can be used for behaviour. You just wipe it clean and start again next week.